The literary archive of the Golden Goose Press of Sausalito, California, will be up for auction at Christie’s on June 16. Neal Cassady’s “Joan Anderson letter” to Jack Kerouac was discovered in that archive, which we reported on last week. The Joan Anderson letter will be sold separately in the same auction. The Golden Goose archive contains nearly 200 letters, pamphlets, pieces of ephemera, and related material from the heyday of the press during the 1950s and 1960s. 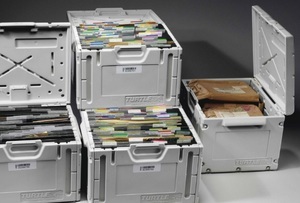 The estimate on the archive is $10,000-15,000. Richard Wirtz Emerson and Frederick Eckman founded the Golden Goose Press in Columbus, Ohio, in the late 1940s before relocating to Sausalito in the 1950s. There the press attracted contributions from many prominent mid-century poets, including William Carlos Williams, E.E. Cummings, Kenneth Rexroth, Robert Penn Warren, and Ezra Pound. The press’s archive, which has never been properly examined by scholars, contains material related to 70 different poets, members of the Beats, the San Francisco Renaissance, and the Black Mountain writers. Its auction presents an incredibly unique opportunity for collectors and academics interested in twentieth-century poetry. The literary archive of the Golden Goose Press of Sausalito, California, will be up for auction at Christie's on June 16. Neal Cassady's "Joan Anderson letter" to Jack Kerouac was discovered in that archive, which we reported on last week. The Joan Anderson letter will be sold separately in the same auction. The press's archive, which has never been properly examined by scholars, contains material related to 70 different poets, members of the Beats, the San Francisco Renaissance, and the Black Mountain writers. Its auction presents an incredibly unique opportunity for collectors and academics interested in twentieth-century poetry.